A large hall ideal for dancing, augmented by two smaller meeting rooms and a well fitted kitchen. Situated on the High Street in Cam. Hall capacity: 100. Stage available. Medium sized Hall and kitchen and stage available. 1. 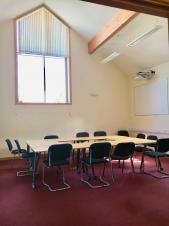 Large room approx 6m x 4m which is carpeted and fully equipped with internet access and seating for approx 30 persons. The building is equipped with a hearing loop and a ventilation system. There is also a small kitchen with tea/coffee making facilities. Cost: £25 per session (Morning, afternoon or evening). 2. 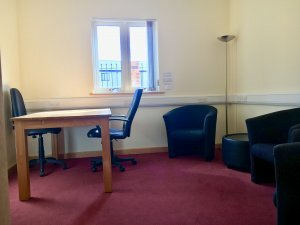 Small consulting room suitable for 2-4 people. Cost: £15 per session (Morning, afternoon or evening). Discounts to local charities offering a service to local people will be considered. Please call us to arrange a viewing or drop in during our opening times to 4 Noel Lee Way, Cam, Glos, GL11 5PS. This facility at Jubilee Playing Fields has changing facilities, a kitchen and wheelchair access. All bookings for the above are made through Cam Parish Council.